I’ve been on a crazy foundation shopping mood for the past few months. 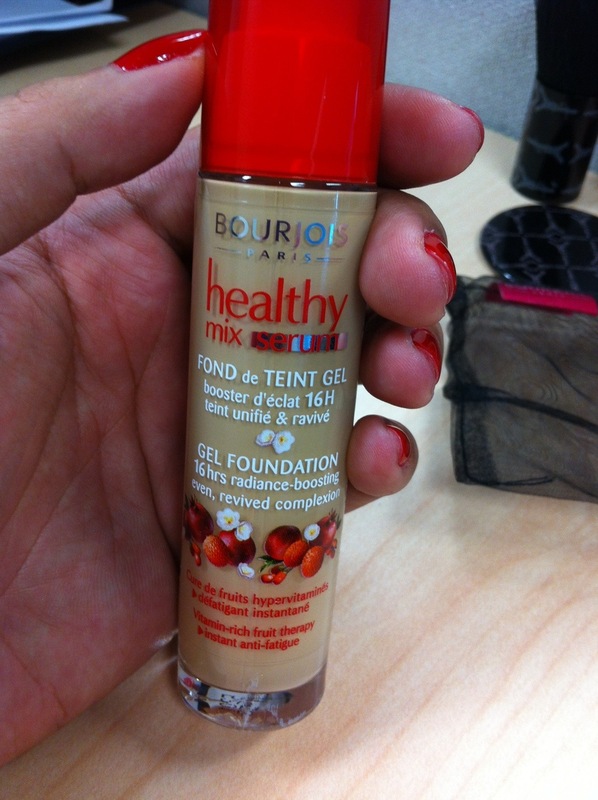 I’ve got those ranging from higher end like Lancôme Mac Stila Benefit yet the one that I’ve been madly in love with is the Bourjois’ healthy mix gel foundation BHMF. Its SGD 34.50 for 30 ml of product. It comes with a pump as well! I very rarely purchase liquid foundations without the pump becuz the pump makes it easier to control the amount of product as well as it prevents contamination. For a gel foundation, I was expecting it to be less liquidy than it came out. I find that E more liquidy the foundation, the messier it gets during application cuz the product slips n slides everywhere such as Korres foundations. However, much to my pleasant surprise BHMF was absorbed into the skin so easily making it a joy to work with. It blended without effort and gave a matte finish. I love foundations that are oil free and medium coverage becuz they don’t look cakey and is more suitable for day time use. It boasts 16 hrs radiance boosting even revived complexion. BHMF seems to be a little of the pinkish undertone rather than yellow which probably is the reason why ur face looks more awake and youthful when using it. Just as a background, I’ve got dry skin on e sides of my face and extremely oily t zone. Foundations oxidize very quickly on my face and all liquid gel cream foundations must be set with a powder or I would be so oily within the hour. I put BHMF at 7 am and set with E powder that comes in e same collection and at 5 pm, my face looks just as it was when I first applied it. All I have to do at lunch is pat some powder and that’s it. It lasts a long long long time. So fantastic. It sorts of balances my skin out. The dry parts of my face look dewy and the oil parts look matte. Awesomeness! I’ve not had any breakouts with BHMF given that my skin is sensitive. e foundation doesn’t sink into my pores or any fine lines either. If u purchase this. Try using once without a primer and see if u can do without one. I usually pair this up with benefit’s porefessional at the most. Somehow I find that BHMF applies well with any of my real technique buffing, stippling, foundation and all purpose face brush. But then again real techniques applies any makeup beautifully. Haha one pump is usually enuf since I use BHMF to even out my skin tone ( my forehead is 2 times darker than e rest of my face ). I use either my Laura mercier or Mac/ mufe concealers and set the powder with a kabuki brush. U can also use ur fingers if u wish. This product isn’t like some cream foundations where u need the warmth of ur fingers to blend the product in. So u can choose either brushes, sponges or ur fingers as long as it fits ur skin type. Also, if u use ur fingers, squirt half of ur usual pump. U won’t need as much as the other modes of application. Watsons n robinsons r having 20% off for bourjois products plus both have 3-5% rebate for their linked credit cards.